L’Artisan Parfumeur was, once upon a time, one of my favorite niche brands. This was way back in the day when I could count my favorite niche brands on one hand, and probably could have listed all the niche brands on a piece of paper (remember paper?) while sipping a cup of tea. Times have changed — niche brands are so plentiful that niche has very nearly become a dirty word, and L'Artisan has changed owners and directions several times over. I don't dislike them, but they are no longer the first brand that comes to mind when I think of my favorites. This perfume pays homage to the history of Grasse. Perfumery in this region with its distinctive lavender fields, dates back to the 17th century and is linked to the historic production of leather. The perfumer has combined lavender and leather with iris and spices creating a soft, faceted scent. Bucoliques de Provence is modern in its pure and naturalistic approach. I think it's the first L'Artisan fragrance from perfumer Fabrice Pellegrin? (And I did love L'Artisan's last "regular" release, Noir Exquis, which seems like five gajillion perfumes ago, but was really just last year.) So I dutifully wrote Bucoliques de Provence on my to-try list, then went right ahead and promptly ignored it for the better part of the year. Ah, but I should have gotten to it sooner. It lives up to its description and then some: it's soft, yes, but it's not without heft or warmth, and it would fit easily into any list of lavender or iris fragrances you'd like to make (I'd place it in iris fragrances for fall). The opening is just enough sharp lavender — I did not used to like my lavender sharp, but now that it's very nearly endangered in perfumery,2 I've come to appreciate it in small doses — with just enough of an aromatic / herbal bite, brightened with a little citrus. The sharpness fades as Bucoliques nestles itself into a cloud of iris, with a few flower petals strewn here and there. The leather, a nod to the Grasse tradition of scenting leather gloves, is done here more like a pale suede, and the whole thing manages to remind me of both a floral-tinged cosmetic powder and the outdoors, near fields and flowers, on a warm day. It is, as advertised, completely unisex. Verdict: I do not pretend to understand what L'Artisan Parfumeur is up to in terms of their efforts to reposition themselves in the fragrance market, but when fragrances like Penhaligon's The Revenge of Lady Blanche get more attention (and I suspect better sales) than Bucoliques, I can't think they're accomplishing whatever it is they intend.3 So I need to remind myself every so often that the scents are still good and the pricing is still mostly reasonable. If only L'Artisan were still selling 15 ml bottles (go ahead and roll your eyes, I know I've repeated it ad nauseam) I'd have bought Bucoliques (and Noir Exquis, and Séville à l’Aube) already. For now, it goes on the buy-list, where it will no doubt linger for all eternity. If anyone has tried any of the Natura Fabularis series, do comment! 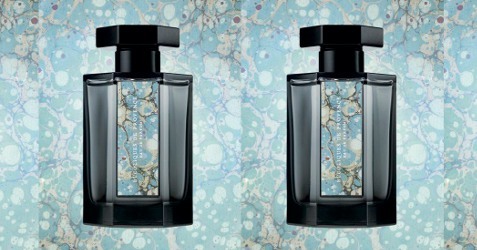 L’Artisan Parfumeur Bucoliques de Provence is available in 50 ($105) and 100 ($130) ml Eau de Parfum. For buying information, see the listing for L’Artisan Parfumeur under Perfume Houses. 1. When I announced the packaging change earlier this year, reader Cries and whispers noted that "it’s lost its original retro bohemian chic identity", and I think that's exactly right. That does not look like a bottle in which you are likely to discover fun. It seems just as well that Ananas Fizz and Jacinthe des Bois are gone; they do not belong in that bottle. 2. By which I mean not that the natural component is endangered, but that most perfumes with lavender these days use molecular fractions that are so soft and smooth, they barely recall the actual flower. 3. I pick on Penhaligon's only because the two brands have been under the same ownership for some years now. When I started out as a perfumista, from my perspective, Penhaligon's was a traditional, somewhat stuffy British toiletries brand and L'Artisan was a venerable yet playful niche French brand with a regular cycle of new releases, many of them (like the yearly summer limited editions) great fun. Translation — I do not own a single Penhaligon's fragrance (and they just discontinued the only one I wanted); there is an entire section of my cabinet devoted to L'Artisan. But in terms of branding, the two brands now seem very nearly reversed from how they started. As minimal and entirely random evidence of how differently they are marketed, I offer up this snazzy video from Penhaligon's and this snoozer from L'Artisan. I tried this on a blotter in August and was pretty heartened by it, though I hate the color of the new bottles. I mean, they’re beautiful but Dzongkha doubt cine out of a black bottle, let alone Dzing! or Chasse or what have you. Anyway, that rant aside, it seems clear L’Artisan is clueless but knows how to make gorgeous stuff. I can’t wait to try this again. Does it remind you of either of Hermes’s leathers? May they never axe Dzongkha! It could definitely be related in some vague way to Cuir d’Ange. I wish they’d go back to the original bottles. The last ones before this design were already too severe, now these are even more so. Yes, I smelled it with a groupe of French bloggers and we all saw a connection with Cuir d’Ange. Still, we agreed it was quite lovely. This sounds interesting, but… I probably have 5 or 6 bottles of various vintages of Jicky. So the lavender slot is nicely (overly?) filled. And lately, since the IFRA era began, I end up being disappointed that the list of notes don’t begin to equal what my nose remembers those notes should smell like. I think that means I’m old that I’m remember “the good old days”! You’re just looking for another stone for your enabler’s pin! Hmm… I do need another iris though. ‘Need’ being a relative term. Never hurts to have another stone! But it really isn’t anything much like Jicky. Will also point out that the loss of the “real notes” from the old days is not just about IFRA, but also very much about style, consumer preferences and advances in chemistry — in fact, with notes like lavender I think those are far more important than IFRA. I think you may be right in many instances. It makes me sad though; I love the real thing! And don’t forget to add cost. I’m sure most aroma-chemicals are cheaper than essential oils. Bizarre that they both have the same owner – L’artisan sounds like it doesn’t have much love and attention given to it from within the company and they’ve just left it on autopilot. The one good thing about the L’artisan rebrand was that they dumped all their old style bottles with discounters. I managed to get a new 100ml bottle of fou d’absinthe for £25 to replace my nearly empty bottle. You’re not the only one who’s puzzled about the direction L’Artisan is taking. Black bottles like Kilian. Name of the perfumer on the box like Malle (*except* Bertrand Duchaufour — and he did about half of their fragrances). Daphné Bugey who is very close to Le Labo. Fabrice Pellegrin who does practically all the Diptyques… Bucoliques is quite lovely, and so are Pellegrin’s next, Impressionist-inspired colognes. But, as the Monty Python used to say: “You’re no fun anymore”. Seriously, did they put the names of all the perfumers on the boxes except BD? I did not even know that. What is the reason? I get the impression it’s got something to do with the American CEO who was brought in by the holding company that owned both L’AP and Penhaligon’s before they were sold to Puig. He’s still running the companies under the new owners. Since BD was perfumer-in-residence and had his lab over the flagship store, things probably didn’t go smoothly when the store was shut down. Still, either you put all the perfumers’ names, or none, right? That’s just weird. I wish they’d sell L’Artisan to someone else, it just feels like it is not being managed properly. Love to read Robin’s reviews, and glad to see you liked this one! I enjoyed the lavender, iris, leather combo, and would not mind having a bottle of this at some point. Thanks, and maybe we will both get lucky! p.s. One good thing that L’Artisan did recently is offer their samples through the website (this is how I managed to try Bucoliques). On the other hand, there seems to be no way to get Diptyque’s new Kimonanthe … And Penhaligon’s? They recently discontinued Elixir, Amaranthine and Ostara (the only FBs that I own from this brand). Go home, Penhaligon’s! Elixir was the only one I liked, but I do admit it seems like a bad fit with the rest of the brand. It would be a better fit with Diptyque, actually. Diptyque has become much easier for me to sample now that they’re at Nordstrom, but I have not gotten my hands on Kimonanthe yet. I was hoping to love Bucoliques de Provence but unfortunately it didn’t happen. I still love new bottle and stylized label of this one. It’s interesting how long it takes to realize and then finally admit that one really doesn’t love a brand anymore. I blame IFRA primarily. Really, why? I had not thought of L’Artisan as a casualty of IFRA at all. Well, I was also thinking about other brands, such as Serge Lutens and By Kilian, that I used to like, and how many newer brands I don’t like. I think it gets harder to make interesting perfumes because of IFRA. Do you think it’s more a question of what L’Artisan is trying to do? It makes me sad that some older perfumes can no longer be made because of regulatory or supply issues (some of which, but not all, are related to IFRA) but it is not like perfumers are now working with a more restricted palette, quite the opposite. So I don’t see that as the problem. Adding — but did not mean to argue with you! Just meant I don’t really see IFRA as a big problem in that sense, but I’m well aware not everyone would agree with that. Not to worry, Robin, I appreciate your perspective. I actively dislike some of the new ingredients, especially those spiky woods, fractionated patchouli, etc. To be fair, one can’t blame IFRA for the lack of sandalwood. I don’t exactly HATE the new bottles and from a marketking/retail standpoint I can SEE where they’d like to head, but the old bottles are so much more approachable and “cozy” somehow. And as Nathanthomas pointed out, super-reasonable at the discounters, so that’s good! Well I don’t hate them either, I just think they are very severe looking for some of the more playful scents, and just wrong for some of the more feminine scents. It is all wrong for a delicate springtime floral like La Chasse. And you are exactly right, they do not look approachable. For some brands that might be perfect, but it seems a bad fit with L’Artisan. Robin, I love reading your writing. Thanks for this. I totally agree that a lot of those scents are ridiculous coming out of those dark bottles!!! That said, the new bottles feel great in my hands. They really are much nicer than the older ones, even though I preferred the spirit of the older ones. As far as marketing goes, I think this is what happens when they want to “play against type”/”shake ’em up”/”do something new” with 2 different brands–it’s like they’re becoming each other. Seems like an accident of history that they ended up linked at all. With huge apologies to its fans, I do not care what happens to Penhaligon’s, but I have a serious nostalgic fondness for L’Artisan. BTW, I saw the new bottles at Bloomingdales. I had expected them to look better than they did, based on the photos. I guess I had high expectations that the dark crystal would look really cool, even if they didn’t suit all of the perfumes. I found the unshiny black caps a bit dull, too. Maybe they thought men would be more comfortable with these dark bottles? I sniffed Dzing!, which I own and had worn recently. I thought it smelled a bit different, but OK. I didn’t try it on skin, though, so I don’t know how it would do throughout its trajectory. I don’t mind the dark bottles, but I will miss the illustrations. Particularly the lady and her tiger on Dzing! – it so wonderfully captured the spirit of the scent, and it makes me smile every time I look at it. Yes, the lady on the tiger is perfect! Thanks NozKnoz, good to know. I will probably never replace any of my older bottles so any reformulations will hopefully escape my notice. Need to see if the San Diego Bloomingdales has these, I don’t think so but worth a try especially with the new Jo Malone out there. The Tysons VA has an entire niche section now, and that’s where the L’Artisans (and Penhaligon’s) are. I had to evangelize Dzing! with the SAs, though. Someone asked for leather recommendations, and they didn’t even mention it Dzing! Very interesting article, Robin, thank you so much. You’ll no doubt appreciate we’r opposites, in that I am a longtime Penhaligon’s fan (though not so much recently!) & was a relative late-comer to L’Artisan, though I did love their stand-alone shops in Marylebone & Covent Garden, the latter being where I bought Mure et Musc, a bit of a throwback to my first forays into ‘proper’ fragrance as a teenager. The new Penhaligon’s range with their over-the-top stoppers do nothing for me, & the one that is supposed to be closest to the quite new but already discontinued Ostara (& I was so underwhelmed I can’t remember its name!) is nothing like the beautiful Ostara, I humbly submit. No idea what the parent company is trying to do, other than reach a wider market no doubt, but I don’t approve! Also, Penhaligon’s no longer has the comprehensive range of leather goods it used to, much to my disappointment, nor some of their other previous gift offerings. Many years ago I bought a tiny change purse in the shape of a red apple, with the standard mini bottle silver fastener – it’s still going strong & often elicits comments from SAs unfamiliar with the brand. Penhaligon’s has definitely changed too. I wonder if they still appeal to people who loved their more old fashioned scents like Bluebell & Artemisia? Was very surprised to see Ostara go…it certainly seemed like the perfumista favorite. I know that doesn’t always translate into sales, but still was surprised. Well, you know me – as long as they keep producing Bluebell, I’ll keep buying it! From chats with assorted SAs in a couple of London branches, seems like Ostara was phased out so the one allegedly similar to it in the new, more expensive range could be phased in. Well that’s just all the more insulting to me. The bottles are funny / kitschy, but that’s not what Ostara is. Short answer: Penhaligon’s and L’Ap seem to be working mostly with Firmenich perfumers now. Ostara was by Duchaufour, and likely not a strong seller. A pity. Like Amaranthine, it was a truly gorgeous scent. I have no relationship to L’AP and so none that I’ve tried have been ‘me,’ but thr Naturalis line inside a line is dangerous. The bottles are adorable, but more importantly I like just about all of them. Violaceum 2 is a beautiful suede-like violet, maybe not super long lasting, but I need a spray rather than dabber to tell for sure. And the vetiver – it has the word Glacialis in the name – is also frostily and green and great. All the others were lovely on a quick dab, but need more skin time. Hi Robin, I enjoyed your article and agree with you on many points. I first came into niche fragrance through L’Artisan and one of my favourite scents in the line is the long discontinued Navigar which I bought at the perfume shop in Yorkville. I love the saltiness and the longevity and it is my rainy dreary day fragrance that is very comforting. After that I added Drole de Rose, Timbuktu and Patchouli Patch to my collection. I loved the shape of the bottles and the coloured labels. I only wish I had bought Ananas Fizz. I have to say I do not like the new bottles or the new labels. It seems to me that they are very “corporate” in their appearance and meant to project an image of high end exclusivity. Sigh..that seems to be the way perfume is going with crazy price points. Whenever I spritz my L’Artisan they remind me of the early days of niche perfumes when things were fun and not so corporate. All of those were lovely, and I wish I’d bought Navegar when it was still around! I still wear L’Eau de L’Artisan, and Drole de Rose & La Chasse & Timbuktu & Passage d’Enfer & Dzongkha, and several others — it was one of my favorite lines for a long time. “Corporate” is a good way to put it, and it is so unlike what they used to be.